Herodotus said “Egypt is the gift of the Nile” and we witnessed it first hand! In the middle of this immense dessert we saw this beautiful developing country come to life around the Nile everyday, in every sense of the word. The key of life was an important ancient Egyptian symbol that represented the Nile; its Delta to the North, its long body, and its two branches to the east and west representing the two main tributaries, the Damietta and the Rosetta. This is the place where human civilization began and where you find the most incredible signs of these ancient people and their beliefs everywhere. Don’t go to the pyramids and think you have seen Egypt; there is a lot more to discover deep in its desserts, mountains and valleys. It is incredibly hard to express in words, or even in pictures, the amazing prowess and intelligence of the ancient Egyptian civilization, the time of Pharaohs and Queens. This is the true epitome of Faith where all that truly mattered was the gods and the after-life; which was well represented by incredible structures like the Pyramids, temples and tombs with magnificent carvings, paintings and statues. A lot of importance was put on the transition into the after life. And there is a bonus… Egypt’s people are very hospitable and welcoming; SERIOUSLY go see it for yourself!!! “Welcome to Alaska” they say to us as we pass by and the temperature soars well above 40 degrees celsius (104F). It is freaking HOT everywhere! I have never drank so much water in my life! I decided to join a tour to Egypt, probably the only one that I will do during my round-the-world journey. With all of the bad news about Egypt since the Arab Spring of 2011, I got a bit nervous about traveling here on my own so I opted for a very complete 15-day itinerary with Intrepid Travel (definitely recommend!). At the beginning I thought this may not be worth the money but I quickly found out that it is the best thing that I could have done. We had an excellent guide Waleed who did a superb job in leading us through the country and its ancient marvels. I highly recommend using guides here, there is just too much information that you cannot get on your own and that only a highly educated Egyptologian like Waleed can give you. Tourism has definitely suffered in the Middle East in general, especially in Egypt. It was lucky for us that there weren’t many people around and we were able to photograph the Pyramids and Sphinx, amongst other important structures, with not many people around them but it is sad for this country whose economy relies heavily on tourism. There is high security everywhere; military convoys are required for all tourist excursions out into the dessert and to other cities from Cairo. We even had security officers in our car with us at times. We had to go through metal detectors at the entrance of every hotel where we stayed. I wish Egypt and its people well and hope that things get back to normal for the sake of its continuous development to becoming the great African nation that it can be. We began our trip in Cairo and stayed at the Caroline Crillon in the Giza area. This mid-range hotel was a bit outdated but it seemed to have the only decent WIFI connection in the country. I met the sweet and intelligent Darcie from Australia who ended up being my roommate during the entire trip. I was worried about having to share a room with another girl for so long but she was the easiest person to be around. Before meeting the rest of the group, we ventured out to see the famous Tahrir Square in downtown Cairo which is the place for all political demonstrations, especially the one that led to the 2011 Egyptian Revolution and the resignation of President Hosni Mubarak. We also visited the spectacular National museum of Cairo where we were not allowed to take photos. 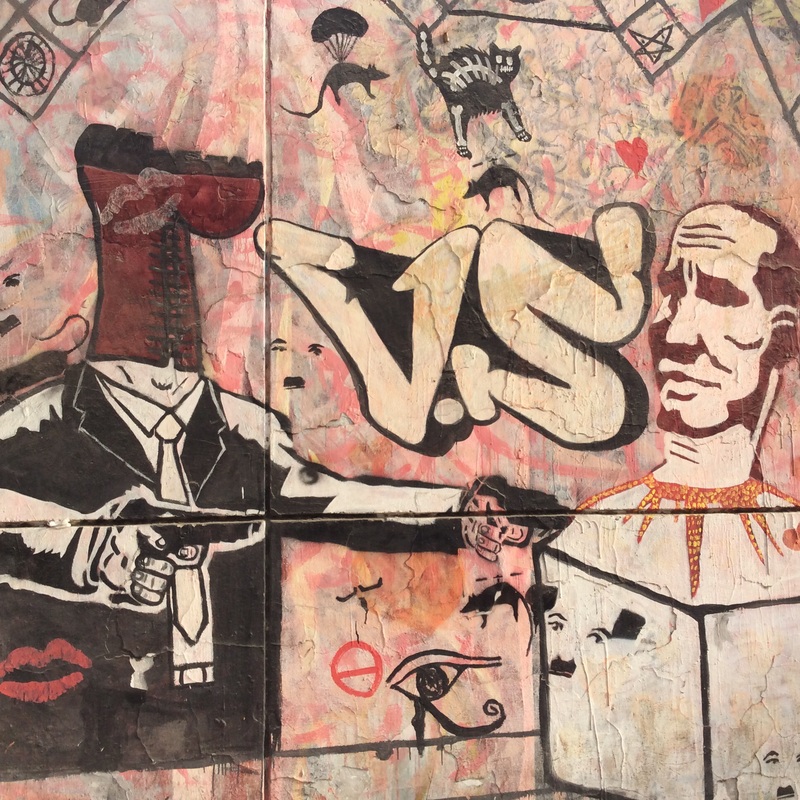 Graffiti has become very popular in Cairo since the Arab Spring and Egypt Revolution of 2011. Cairo is a huge bustling city with about 22 million people. Although traffic is bad, it was fairly easy to get around and it felt safe everywhere. The facade of the buildings is grey and rather sad. A lot of them seem to be under construction. Waleed explained that most of them are left unfinished so that families’ next generations can continue to add stories. They also manage to avoid property taxes by leaving them like this. You see people wearing the traditional Gallibayas or long dresses everywhere. These are usually the preferred attire of the farmers to tend their crops in the unbearable heat of the day. Some wear turbans or head dresses as well. The married women wear black Gallibayas, sometimes covering their faces, to avoid attracting any unwanted attention from men. Darcie and I later joined the rest of the group Ty, Thibault, Jo, Ian, Vladimir, Katarina, Kim, Jay, John, Amar, Michelle, Tony x2 and James who came from various countries- Belgium, Croatia, New Zealand, the UK and Australia. We were a very fun bunch who got along well. We spotted the Pyramids as we drove deeper into the Giza area. I got goose-bumps when I saw the big one. This has been on the list for so long and I felt very fortunate to finally be there to see it. The pyramids were simply majestic! Waleed gave us the explanation behind their structure and how their construction evolved from a covered subterranean tomb into the gigantic, perfectly triangular structure. These were built for the Pharaohs during their life time. The big pyramid took about 20 years to build. Some of us paid extra to go into the top chamber of the big pyramid. We climbed up through a narrow passage to come into the cave where the King’s mummy was supposedly laid in his tomb with his treasures. What a cool and unforgettable experience to be able to walk into the Great Pyramid of Khufu (Cheops), one of the new seven world wonders! There are 9 pyramids in the area and 111 pyramids in all of Egypt. The camel and the pyramids Khufu, Khafre and Menkaure. you can find these guys offering rides on camels all over the area. While the others went to the museum that afternoon, Darcie and I went to see the most popular and biggest Souq (market) in Cairo, Khan El Khalili. We visited one of the mosques inside before the shopping. We took the over-night train to Aswan on the East side of the Nile, about 13 hours of travel time from Cairo mostly spent inside our cabins. They were small but clean and fairly comfortable and the service from the crew was very professional. The train station was your typical African railway madness, full of people everywhere, dirty facilities and the constant staring, but always fun of course! A few of us found a small cafe to relax while we waited for our train to arrive. We gave our order to the waiter who agreed to everything and about fifteen minutes later he came back to tell us (in arabic) that he had run out of pretty much everything. We were obligated to buy Fayrouz, a local fizzy pineapple drink; which turned out to be quite refreshing. In the train, we got an airplane style dinner tray with meat, rice, potatoes, and bread. We woke up to views of farmers working away in the banks of the Nile river. After seeing so many concrete grey buildings and so much dessert, the lush greenery outside of our windows was a welcoming sight! In Aswan I decided to take the afternoon off to relax a bit and write. When you travel long-term you need these breaks once in a while to recharge your batteries. In the afternoon we took a nice cruise on the Nile, in my opinion, the best way to enjoy Aswan and its enchanting sites of temples and old monasteries on its banks. As part of the planned tour, we were invited to have dinner at a local Nubian family’s house on Elephantine island. These were close friends of Waleed’s. They served us delicious fresh mango and guava juice, chicken, salad, rice and potatoes; which we all enjoyed very much. On this day, we were all concerned over the terrible news about the Mexican tourists that had been killed by mistake during an Egyptian military anti-terrorist mission in the White dessert. The massacre had taken place in one of the places that we were scheduled to visit a few days later. Waleed was very open and transparent about the situation and immediately asked us to call our insurance companies and make decisions about whether we still wanted (and if we were allowed by the insurance) to visit the White dessert. Of course this was an extremely hard decision to make. We were concerned about our safety most of all but we also wanted to see Siwa, the Bahariya oasis and the white dessert; which are supposed to be pretty unique and mesmerizing sites. Luckily we were later informed that the government had closed the dessert to all tourism and we no longer had to make the decision. Waleed prepared a new itinerary for us; which included an additional day on the Feluca on the Nile, an additional day in Luxor and two days on the Red Sea in Hurghada, before visiting Alexandria. The only remaining issue was that our new dates to stay in Alexandria coincided with one of the biggest holidays- when Muslims celebrate Ibrahim offering to sacrifice his son Ishmael (per the Quran) to God. There was no hotel availability anywhere. 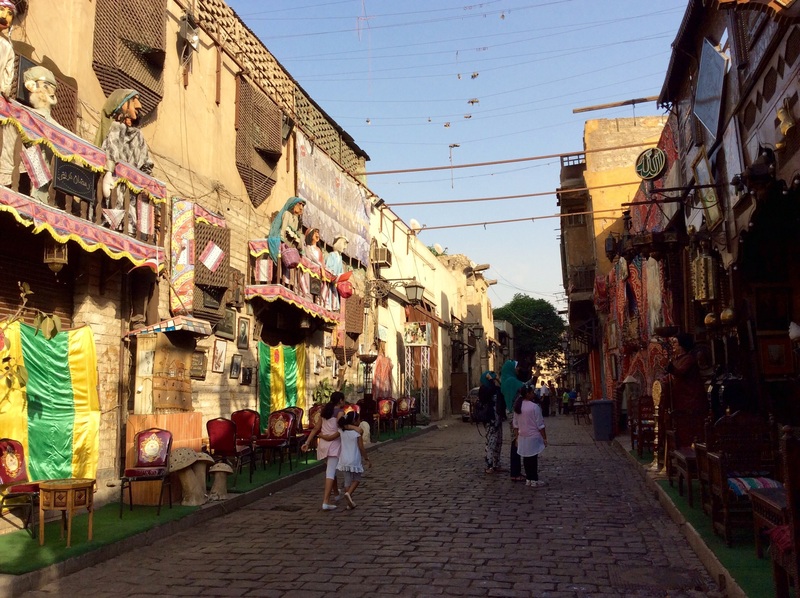 Waleed offered the option of staying an extra night in Cairo and do a day trip to Alexandria but most of us did not want to miss out on our two days there. Waleed finally put a bit more pressure on the management office and not only found us a hotel for two nights but Intrepid also included all of the activities free of charge; which were previously considered additional excursions at our own expense. We were all very happy! We drove to Abu Simbel, located on the West Bank of the Nile, south of Aswan and only 40 km north of Sudan. It overlooks the largest artificial lake in Africa, Nasser Lake. We drove there in a caravan with other tourist mini-buses and a police convoy leading the way for safety. This is one of the most important and incredible ancient sites in Egypt, the great Temple of Ramses II, also dedicated to the Gods Ra, Ptah and Amun. This temple was rescued from the rising water of the Nile before it would completely submerge. The structure is very impressive but what is more spectacular was the great feat of dismantling and re-assembling the entire thing about 300 meters away from its original location; which took about four years. The two days spent on the Feluca were very enjoyable. We spent the second night on mattresses all spread out over the main deck and enjoyed a beautiful sunset, an amazing dinner, and drum music played by the crew on the upper deck. We enjoyed a few drinks while watching the sunset and listening to music. We also had the opportunity to swim in the Nile a couple of times; no crocodiles on this part of the river. Tariq who was managing the sails and steering the boat let me try it for a few minutes. It was extremely hard work as the boat has to go in a zig-zag and I had to use my entire body weight to steer the boat from side to side. We learned that since 2013 there has been very few tourist Felucas on the water, around 21 only vs. the 340 that they had been accustomed too. On a side note, I enjoyed watching Waleed and Amar, both Muslim, perform their daily prayer ritual where they do the various body movements as they repeat parts of the Quran and pray to Allah. Putting the religious part aside, I can describe this moment as total serenity and concious-mindfulness. It is almost like a sort of meditation where they participate with mind, body and soul and their only focus is their God. Maybe I am romanticizing it too much but this is what I get… it is a beautiful moment. We were met by our mini-bus near the Feluca docking point to drive to Luxor. We drove by fields of sugar cane, corn, clover and markets were families were busy buying everything they needed prior to the Friday noon prayers when everyone goes to the mosque. We saw farmers in action all around us. We visited Luxor, known as Thebes, the wealthy capital of Egypt due to its foreign trade and agriculture. It was made the capital during he 11th dynasty (2055-2004BC). We visited the Temple of Karnak and the Temple of Luxor (from outside only) on the East Bank and the Valley of Kings and Temple of Hatshepsut on the West Bank. Karnak, the great temple of Amun, was my favorite site in Egypt and the most impressive (after the pyramids). This temple covers two square kilometers and it has amazing structures of pylons, sanctuaries, obelisks, temples and tombs… the detailed carvings on its sandstone rock structures everywhere was pretty spectacular! The temple was built over 2000 years where every king continued to add to the structure in order to worship the God Amun, God of Gods, represented by the Ram. It had been built right on the Nile but it is currently about 1.5km away as the river has changed its course over the centuries. I urge you to read more about it here. We visited the Valley of Kings; which is where you find around 63 royal tombs from the New Kingdom period (1550-1069) BC. During the 18th to 20th dynasties, the country became known as the Empire of Egypt. This is the period when burial grounds changed from the pyramids to tombs mostly due to robberies. One entrance ticket allows you access to only three tombs with the Tomb of Ramses IX being very popular, and you can pay extra to go inside the Tomb of Ramses VI and the Tomb of Tutankhamen. We were not allowed to take photos inside. As usual Waleed gave us a lot of interesting information on the tombs and the mummification process before we entered the tombs. We learned that mummification was done in three stages. They would liquify the brain, take out the kidneys, lungs, intestines stomach, mummified them and stored them inside the canopic containers. They would proceed to salt the body for forty days to absorb all the liquid and they left the heart inside as it was the organ that had the good and the bad deeds of the person’s lifetime. They made cuts for the blood to leave the body, then they would cover the body in bandages and use a tusk to tap the lips to allow the mouth to stay open so the deceased could answer questions during his journey to the underworld. Some interesting things that I learned: For the Egyptians, death was the transit to the after life. The after life was much more important than life as partly represented in the fact that houses were built in mud bricks but the tombs were built in stone. The journey to the after-life was led by God Ra. This journey would be on a boat in the skies, as a reflection of the Nile on the earth. The Pharaohs would go through twelve stages and be questioned by forty-two judges that would ask questions in the negative form, for example “ Did you not pollute the Nile?”. The heart was measured by the good deeds vs the bad deeds. The judges would weigh the heart against a feather and it had to weigh less in order to pass. The Pharaoh was believed to be a semi god figure and the leader to paradise, but still a human being so he was judged just like anyone else. The workers of all tombs became the tomb raiders themselves. We also visited the funerary temple of the first female Pharaoh Hatshepsut; which was carved on a limestone mountain. This is known as the hottest place in Egypt and the heat was in fact over-whelming and hard to escape, even in the shade. A row of Sphinx statues used to line the path leading up to the temple. In this temple you find amazing carvings depicting an expedition to the Land of Punt (actual country unknown), animals and the root of a myrrh tree, left over from lush gardens that once covered parts of the path, and images of the project to move the obelisks to the Temple of Karnak. The female pharaoh asked to be depicted as a male. A long ramp leads to the upper part of the Temple with an amazing gate entrance. After a long and hot day we enjoyed a nice dinner on a roof top with a view from the Luxor Temple, followed by a fun visit to the market with my friend Thibault. We checked out the tourist souvenir side and the real Egyptian market; which had more produce and men playing dominos everywhere. My favorite is the spices stands, always so colorful. You definitely get hassled a bit but for the most part people are very nice and welcoming. We topped the night with a walk to see the gate of the Luxor Temple from the side of the street and enjoyed a nice horse-carriage ride back to the hotel. The following day we began our journey to Hurghada on the Red Sea, just south of the Suez Canal. we drove parallel to one of the canals built for irrigation purposes and tons of farming communities. Along the banks of the canal we saw farmers on their tractors or donkeys busy at work and others with refreshment carts and wash stations under the trees to offer relief to other farmers from the harsh mid-day heat. We stayed at the Triton hotel; which was pretty luxurious compared to the others where we had stayed. It was all inclusive with breakfast and dinner, can’t beat that! There was one problem for the group though, no free WIFI at the hotel so we had to go to the Peanuts bar nearby to get it; which became our temporary watering hole. Hurghada is very touristy and all the resorts pretty much cater to the Russians who completely fill up this town. Even the Egyptians that work at the Dive resorts and hotels all speak Russian. A few of us enjoyed a magnificent sunset at the nearby beach, as background to the small marina and went for a swim in the hotel’s private ocean pool. After an awesome stay in Hurghada we find ourselves on our minibus for a six hour drive back to Cairo. The only good thing about going back to the city is getting good WIFI and meeting Waleed’s family. They have invited all of us over for dinner to say goodbye and to celebrate the end of Eid-Al-Adha. We drove along the Gulf of Suez through pure dessert and many oil rigs in the ocean. We learned about the political issues of Egypt from Waleed, about the old President Morsi from the Muslim Brotherhood party who took over after the 2011 arab spring protests. They stood for bread, freedom, and social justice. We also learned about the interim governance of the military and how Morsi and some of his political party members are now on death penalty for various crimes of selling national security information to Hamas in Gaza, escaping the country during the revolution, and the killings of protesters in front of presidential palace among others. The current President Sisi who deposed Morsi while in the army resigned and ran for presidency and won with 97% of the votes, against just one other candidate. We also learned about the Suez canal and how 20,000 Egyptians died during the mandatory labor to build it due to improper food and water supply. After Hosni Mubarak stepped down (after the 2011 protests) and they held parliamentary and presidential elections around 30 out of an eligible 57 million Egyptians waited in long hours in the horrible heat to vote for the first time in their lives. We were disappointed to hear that Waleed like probably many others, is disillusioned with their new “democracy” as things have not changed very much since the revolution took place. He even says he will not vote again… 😦 Hopefully they will get a wider range of candidates that will offer more options to the Egyptians on the next election. Our last stop in Egypt is Alexandria; a large city on the Mediterranean Sea built by Alexander the Great. This was the capital of his empire because of is strategic location. Alexander named himself King of Egypt and was considered as a semi-God, like the previous Egyptian Pharaohs. We enjoyed a visit to the National Museum; which turned out to be more organized and better labeled than the Cairo Museum. We were there during a very important holiday for the muslims, Eid-Al-Adha; which is when they celebrate Ibrahim offering his son Ishmael as a sacrifice to God as stated in the Quran, (Isaac in the old testament). God gave him a sheep instead so as a ritual people sacrifice sheep and enjoy a big feast. We saw quite a few butcheries all over the place slaughtering and getting ready to sell to the public for the big feast. We also visited the Kom El Shokafa Catacombs; which were the public burial sites during the 1st to the 5th centuries in the Greek-Roman period of Egypt. It was very interesting to see the art inside these places and on the tombs; a combination of Egyptian Gods with Greek clothing and decoration like the Head of Medusa, who was the protector of these. I learned that the word Caesarean (known as c-section) comes from when Cleopatra VII gave birth to her son from Caesar, who they named Caesarion. The catacombs were large underground rooms of different levels with massive private tombs and public square burial spaces, one on top of the other. Some of the ruins were placed outside where we could take photos. We went to the water front where we could see the fortress that was built to defend Alexandria from Napoleon. Darcie and I enjoyed getting some henna tattoos. We visited the El Morsy Abulalabbass mosque where we learned some interesting things about Muslims and their religious traditions like the Five Pillars of Islam. One of them is to visit Mecca in Saudi Arabia but it is very expensive. Some rich people will sponsor poor people to go. We learned that the Imam only recites the Quran and does not do any other preaching. We also learned about their body movements during praying, like the one where you see the devout get on the floor and touch the carpet with five points of their body to show full submission of their will to God. We also learned that the true meaning of Jihad is “strugle”. The first form is to control your desires, the second form is taking care of your parents in their old age and the third is for war but only in the sense of defense and never offensive towards others like it has been interpreted by terrorists and the media. We arrived in Cairo and visited the Coptic section and the Islamic town. We visited the Church of Al-Mu’allaqa; where we saw a map of the journey that the Holy family took through Egypt when they escaped Palestine as the Great Herod had ordered to kill all the new born children. They allegedly stayed here for three years and we saw one of the stops where they are believed to have used. The Coptic church is unique to Egypt; they don’t follow the Pope in the Vatican as they have their own Pope. One of the major differences that sets them apart from the Roman Catholic Church is that they don’t believe the holy spirit and body were separated. The first cross that they used for the church was the same as the Egyptian Key of Life. The cross later changed to one with four arrows to signify the spread of the religion to all coordinates (north, south, west, east). We also entered an old alley in Cairo with a gate; which reminded me of the old City of Jerusalem. We visited the Fortress that encloses the Islamic part of the city built in the 3rd century AD but was later enlarged and renovated. We later visited the Islamic Cairo and enjoyed seeing structures from the Mamluk Sultanate (1250-1517). Mashrabiya windows used by muslim women to people-watch without being seen. Egypt was such an amazing and enchanting place with a history that no other country in the world can surpass. An incredible civilization that left us completely in awe. I will miss Captain Waleed and the incredible group of people that I had the chance to meet during this trip and who shared all of these wonderful experiences with me. Thank you!